PERED technology is also known as ‘Persian Reduction’ technology. It is the direct reduction technology invented and patented by ‘Mines and Metals Engineering GmbH’ in 2007. The PERED direct reduction process converts iron oxides, in the form of pellets or lump ore, to highly reduced product suitable for steel making. The reduction of iron oxide takes place without its melting with the help of reducing gases in solid state in a vertical shaft furnace. This technology improves the process of direct reduction for the production of direct reduced iron (DRI). The process is a gas based direct reduction process which has been developed by a team of specialists having experience in different areas of the direct reduction process to ensure that all the flows of different processes are taken care in the main process to obtain optimum and efficient results. The most popular gas used for reduction is reformed natural gas though other gases such as Corex gas and coke oven gas etc. can also be used. PERED technology lowers capital cost, water consumption, maintenance cost, and energy consumption. In PERED, the reduction process takes place at a lesser temperature due to the improved cooling methods and reduced pollutant gas emissions. With less heat, more homogeneous reducing gas, more controllable pellet feed and use of centrifugal compressors, PERED requires less water, electricity and gas to operate, alongside less operational and maintenance expenditure. Output from the PERED direct reduction plants can be in the form of (i) cold direct reduced iron (CDRI), hot briquetted iron (HBI), combination of CDRI/HBI, HBI/hot direct reduced iron (HDRI), and CDRI/HDRI. PERED technology is an improved energy efficient technology and hence economizes energy and resources. It makes optimum use of energy and raw materials which result into reduction in the production costs with the added advantage of being more environment-friendly compared to other gas based direct reduction processes. The technology also provides increased flexibility during operation. It has been created to have flexibility with regards to use of wide variety of raw materials (such as ores with high sulphur) and energy sources. The process can use upto 50 % iron ore in lump form. The process works at proven higher pressure. Dry process gas used in the process results into higher gas flow with the same system, which in turn increases the production or for same production reduces the power consumption. The first direct reduction plant based on PERED technology with a design capacity of 0.8 million tons per annum (Mtpa) started in June 2017 in Shadegan city, Khouzestan province of Iran. The DRI plant started without any problem. The product of this plant had metallization of more than 93 %, and carbon content of more than 1.5%. Plant capacity of 75 ton per hour (tph) was achieved on the first day along with good consumption figures for utilities. The designed capacity of the plant was also reached within a short period. 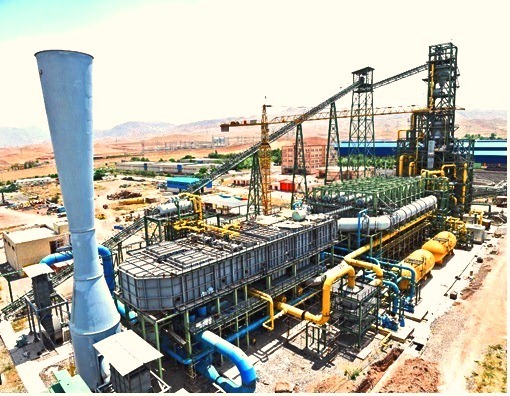 The second PERED DRI plant of capacity 0.8 Mtpa was commissioned during October 2017 at Mianeh Steel Complex in East Azarbaijan province in Iran (Fig 1). Two more PERED plants of 0.8 Mtpa each and one plant of 0.3 Mtpa are under construction. 0.3 Mtpa plant in PR China is based on coke oven gas. PERED process consists of several improvements over existing gas based direct reduction technologies. The most noteworthy features of the PERED reduction process are given below. PERED process is a continuous process which utilizes an uninterrupted flow of reducing gases for the removal of oxygen (O2) from the iron oxide feed material and also for the carburizing of the product DRI. The fuel consumption is minimized by the recycling of the top gas from the vertical shaft furnace back into the process. The gas reforming system is specially designed for the use of the carbon dioxide (CO2) produced during the reduction of iron oxides in the vertical shaft furnace. The system is designed for the catalytic conversion of the natural gas without formation of soot. This eliminates the necessity of an external source of O2 for the partial oxidation of methane (CH4). The process is designed to achieve maximum heat recovery by preheating the main air, natural gas and feed gas. In the PERED process, the innovation and review on main equipment starts right from the vertical shaft furnace. The shaft furnace is unique of its kind and is designed to have improved patterns of the solid and gas flows so as to improve the reactions which are taking place inside the furnace. This results into higher volume of reduction zone resulting into higher production rate. The furnace has dual reducing gas injection which improves the distribution of gas inside the furnace. Ore burden feeding and distribution within the furnace is improved for the achievement of the better results. Distribution of the ore burden inside the furnace is improved because of the introduction of the newly invented feed pipe. The reduction reactions get optimized in the reduction zone of the furnace since (i) there is no equipment in the furnace reduction zone, (ii) there is reduction in the fines generation because of improvement of material distribution inside the furnace due to special feed pipes, (iii) optimization of effective reduction volume inside the furnace, (iv) design of the reduction zone to eliminate possible pollution due to gas leakage, and (v) design of the furnace specially to reduce the capital and maintenance costs. The special design characteristics of the reduction zone of the furnace include (i) dual top gas offtake design from the top dished end, (ii) improved burden temperature profile for ensuring uniform product quality, (iii) reduction in carry-over of the iron ore fines/pellet to improve the life of the refractory at top gas duct, (iv) optimization of furnace size to have the needed reduction zone volume, and (v) lower temperature of off gas because of improved efficiency so as to have lower load on the scrubbers. Reduction zone design characteristics also provide (i) dual reducing gas injection, (ii) rectangular bustle port design for the improved gas injection and better maintainability, (iii) tapered refractory construction to take care of swelling of DRI, (iv) flexibility to have different temperatures and gas compositions because of the oxygen injection, (v) improved utilization of bustle gas, (vi) improved distribution of gas inside the furnace, (vii) uniform bed temperature across the furnace, (vii) elimination of the possibility of clustering inside the furnace, (vii) flexibility to use iron ore lumps, and (viii) improvement in the productivity and product quality. There is also insitu reforming of gas taking place inside the vertical shaft furnace. Hot bustle gas contains a certain percentage of CH4, CO2 and H2O. This gas when comes in contact with metallic iron (metallic iron acts as a catalyst), generates additional reducing gas inside the shaft furnace. The insitu reforming reactions are as given below. On one side, the endothermic in-situ reforming reaction requires higher bustle gas temperature, while on the other side, degradation of pellet/iron ore lump, generation of fines, and clustering occurs when temperatures are high. The design of the PERED shaft furnace has double bustle port to optimize the amount of CH4 in the bustle gas needed for the control of the bed temperature. The special features of the gas reformer used in the PERED process are as below. The cooling zone of the vertical shaft furnace has 360 degree rotating burden feeders. The state of the art design of the feeders provides better and uniform performance of the cooling zone. The burden is fed in the cooling zone with four independently controlled rotating shafts. Since it is cold zone there is no water jacketing. If any cluster is formed then the same is dislodged by reverse rotation and speed control. The cooling gas to the cooling zone is injected from outside header and hot cooling gas is collected uniformly by shaped off takes. Also, there is no chance of failure in the header since there is no refractory in the header. Further the cooling system is designed to eliminate the particles in scrubber. The gas is compressed and fed to the vertical furnace bottom product outlet zone. 3 Diameter of vertical furnace m 5.5 Approx. 4 Total height m 52 Approx. 9 Normal bottom operating pressure for furnace kg/sq cm g 2.1 max. The following are the useful features of a PERED direct reduction plant.